Even though I’ve traded my pilgrim hat for a Santa hat, I have much to be thankful for. Today I’m thankful for my blogging, Twitter and Facebook furrends. I’m thankful that you keep reading my blog even though I don’t have cool giveaways and TW slacks off on letting me visit you. I’m thankful that I’m not still in a shelter like I was in 2005 when TW didn’t think she was ready for another cat, even though she knew I was waiting for a home. I give thanks that my peeps provide hilarious material for my blog even though they haven’t provided much recently. I’m thankful that I’m keeping it real and the peeps still haven’t kicked me out. I don't know if this is going to work but I've made a card to show my thanks on this Thanksgiving. I know the cat is a poor imitation of me, but it was the only tuxie they had. 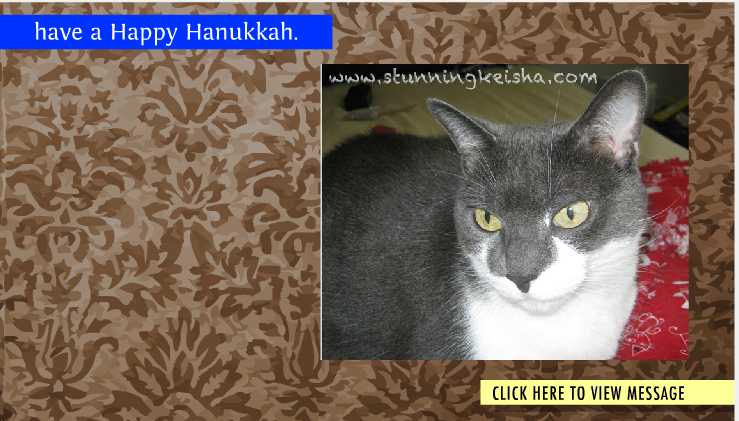 I haven't forgotten my Jewish furrends celebrating Hanukkah. I've made a card for you too. Happy Thanksgiving, CK! I'm keeping my paws crossed that the humans bring home turkey for us kitties! 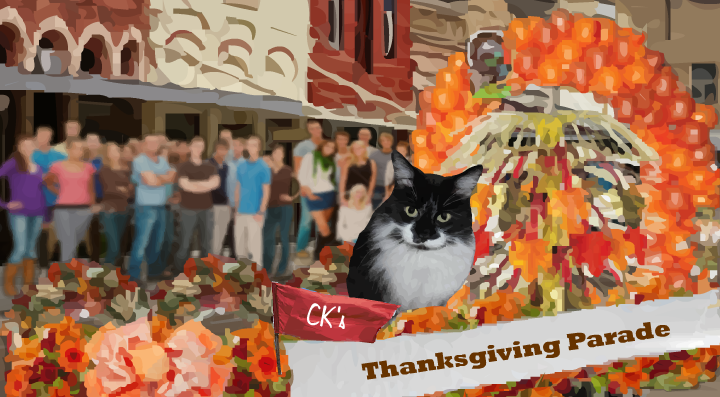 Happy Thanksgiving, CK! And to Pop and TW, too. We're thankful for YOU, your friendship, and for always keeping it real. Warm purrs and hugs to you this T'day. We're social media sharing every blog we visit to share the love and we'll be sharing ALL pics anyone posts at our Facebook page www.facebook.com/CatWisdom101 through out the day. That's a ton to be thankful for, for sure! We're glad she gotcha'd you in 2005 too! Happy Thanksgiving! Will keep on reading. What a nice list of things to be thankful for! Happy Thanksgiving CK! I am thankful to know you, and happy that you have a wonderful home and furever family. Happy Thanksgiving, Keisha! :) We love being one of your friends! Happy Thanksgiving dearest furriend. Kissies. Happy Thanksgiving to you and your humans ! Happy Thanksgiving CK! And Happy Hanukkah! Yoou are soo pawsome! Furry Groovy cardz... Mom sayz dats groovy am old word when CDz were Records wif grooves in dem. Thank you for being our friend...when you're not making us laugh, you're making us snicker. Both of which make every day fun. We are thankful to have you as a friend and we hope you and your humans had a nice day! Purrs from the Zee and Zoey Gang! Happy Thanksgiving dear friends. Love your cards. We hope you got some goodies today and that you enjoyed your Thanksgiving! I bet your Peeps got a good start on that big chocolate turkey! We like that you keep it real, keep on keepin' it real, CK! Happy Thanksgiving!! Those are all pawsome things to be thankful for. We're thankful to have you for a friend!! Happy Thanksgiving, CK! We are so glad to have you as a furriend! And we absolutely loved your cards, both of them! CK we are sooo thankful for YOU and TW....we don't know what we would do without your "tell it like it is" philosophy...thanks for ALWAYS "keepin' it REAL!" WE LOVE YOU!